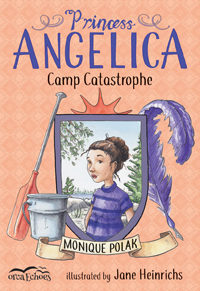 Princess Angelica, Camp Catastrophe: Book Birthday! Angelica isn't a liar. She just loves making up stories. When she goes to sleepaway camp and is mistaken for a princess, she could easily clear up the misunderstanding...but pretending to be royalty is way more fun! When her best friend from home surprises her at camp, Angelica is forced to fess up. Luckily, she also has a talent for repairing things, and when disaster strikes on the girls' kayaking trip, Jelly has to repair more than just her newfound friendships. Mattie's Magical Dreamworld Book Birthday! On Our Street: Our first talk about poverty BOOK BIRTHDAY!